Whether you say yes or no to the power of the Ouija board, there's no dismissing the legacy of this supposed spirit communication tool that inspires intrigue and amusement -- and sometimes fear. For more than 125 years, the Ouija has been an all-American invention that's alternately viewed as a practical way to reach out to the beyond, a slumber party game and a great narrative device in pop culture. Some even see it as a negative creation and a potential gateway for the nastier denizens of the spirit realm to enter our turf. Whichever way you may view it, Ouija is baaack. In the new movie, Ouija 2: Origin of Evil, opening today, the talking board returns as the focus of horror. But regardless of the Ouija's power (or lack thereof? ), it is an undeniable part of our nation's history. 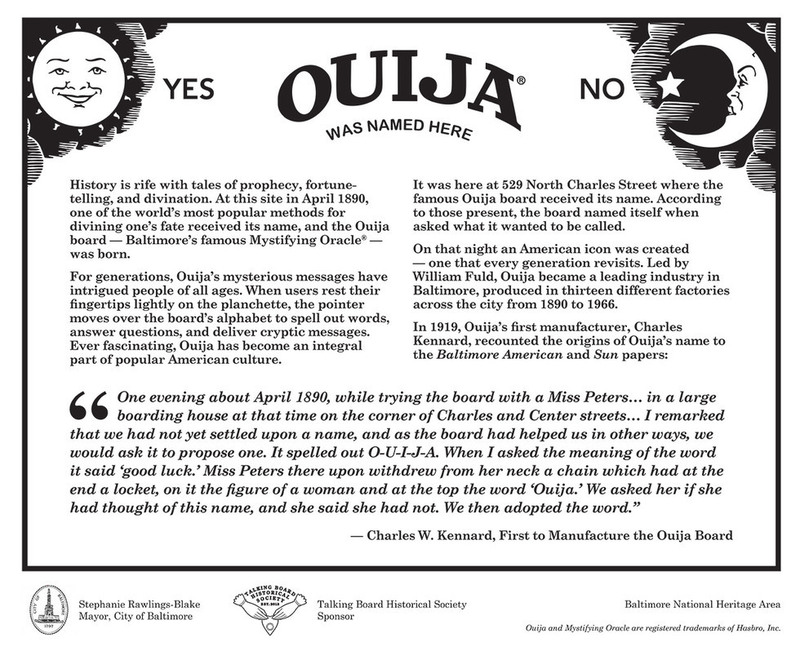 That history was honored last year on Oct. 14 when the Talking Board Historical Society -- led by the world's leading talking board expert, Robert Murch -- worked with the City of Baltimore to install a plaque commemorating the location of an April 1890 séance where the board was named. Though it is now a 7-Eleven, the building at 529 North Charles Street was once the Langham Hotel boarding house. 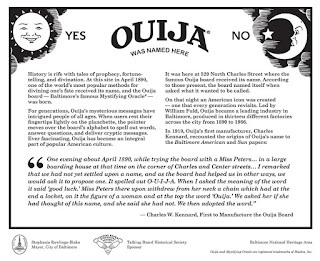 Inside, the board's first manufacturer, Charles Kennard; his attorney friend and fellow Mason Elijah Bond (who registered the Ouija/Talking Board patent); and Bond's sister-in-law and medium Helen Peters asked the board what it wished to be called during a seance. When it spelled out "O-U-I-J-A," the board allegedly said it meant "good luck." Though later stories said the word was an amalgam of "yes" in French and German. And much like the location where it earned its name in 1890, the Ouija board has changed over the years. 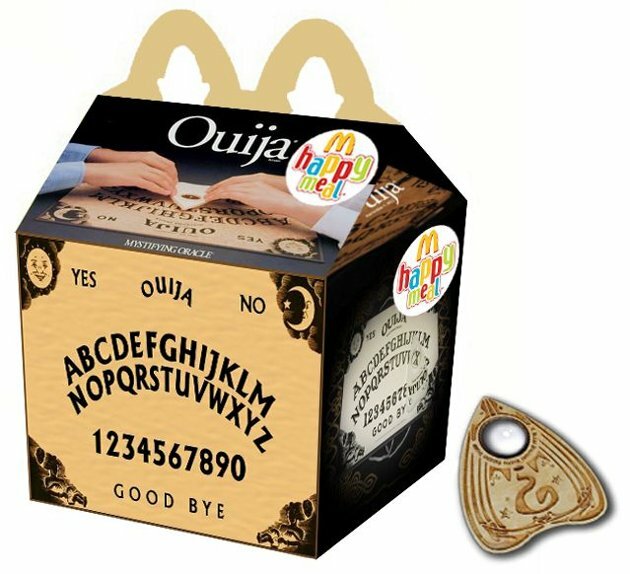 What is currently sold by Hasbro, and marketed as a kids game, is a cardboard platform with glow-in-the-dark letters, or a plastic planchette with an embedded black light to read the board's "hidden" messages. But there is much history to the Ouija board, and the talking boards (aka witch boards) that pre-date the brand. Join me and Murch, who has consulted on the show Supernatural and both Ouija movies, for a brief tour of this mysterious, mystifying (and some would say malevolent and murderous) device. As Spiritualism took off in the United States in the mid-19th Century, followers used spirit communication such as rappings and alphabet calling. Leaders of the movement, like the Fox Sisters, would speak letters or point to them on cards, and waiting for a spirit to knock for its selection. Other forms that came to be used in the 1850s included table tipping, pointing devices, and automatic writing planchettes. By 1886, the talking board was no longer relegated to Spiritualists, and began appearing in American homes. Ohio was ground zero for the talking board craze, and The Associated Press picked up a story about it. The article was an example of how the board was becoming a part of the mainstream. It is unclear whether the W.S. 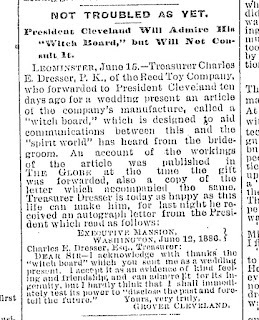 Reed Toy Company's "Witch Board" was the first of the boards to be sold, or if it was a response to what was happening in Ohio. But it was W.S. 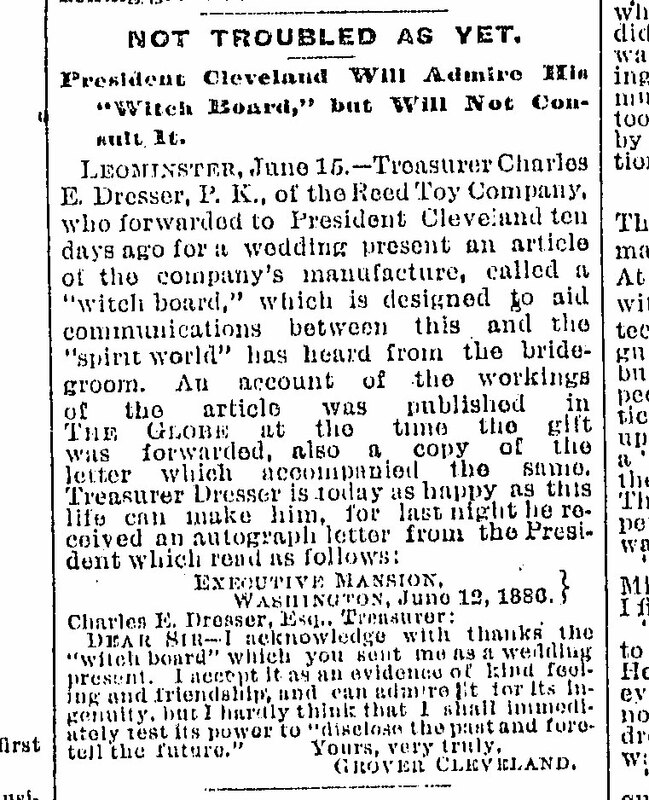 Reed that sent President Grover Cleveland a board in 1886 as a wedding gift. Cleveland stated he admired the invention, but "I hardly think that I shall immediately test its power to disclose the past and foretell the future." Meanwhile, in Maryland, Murch said Charles Kennard and E. C. Reiche, each claimed to invent what would become the Ouija board. Neither man was in the games business, or the spirit business, for that matter. Kennard worked in fertilizer, and Reiche was an undertaker/coffin maker/furniture maker. Though Reiche did eventually prove to Kennard's company it was his creation. Kennard and the aforementioned Bond trademarked Ouija in 1891. The two sold interests in what was the Kennard Toy Novelty company, and William Fuld took over operations in 1893. Murch said Fuld invited his brother, Isaac, to join the company in 1897-98. They were making Ouijas as Isaac Fuld & Brother until 1901, when Isaac was removed from the company – which began a 96-year Fuld feud. As for William, he died in 1927 when he fell off the roof of the factory he was instructed to build by the board. In 1966, Parker Brothers bought Ouija from the Fulds for $1 million. This was the most a game had been purchased for at the time. The company also moved production from Baltimore to the witch city of Salem, Massachusetts. By 1991, Parker Brothers was purchased by Hasbro, where Ouija still exists today. Talking boards have a long history of being blamed for crimes and death. But the first "Ouija victim" was Mrs. Eugene Carpenter in 1891. The divorced 28 year-old consulted the board about whether her husband or lover will return to her. It told her, "He has ceased to love you and will never return." Murch said she was found later, muttering and roaming the streets in a nightgown, saying, "Ouija said so, and I knew it was so…"
Spiritualist leader Sarah Elizabeth Griffin committed suicide via a dose of strychnine in 1900 because God said to do so through the Ouija board. In 1920, after Jennie Morrow was killed in a hit-and-run, her family began round-the-clock Ouija séances; neighbors were held hostage to prevent the séance from being broken. The fallout involved seven people entering a psychiatric ward, and the town of El Cerrito, Ca., unsuccessfully trying to ban the board. 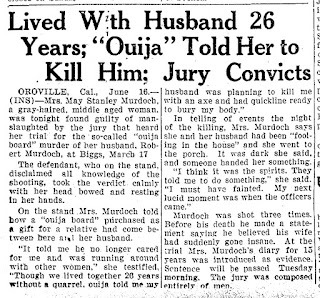 Also in California, in 1923, May Murdoch shot and killed her husband because the board told her he was unfaithful. The Ouija death spree continued in 1930. In New York, Lillian Jimmersen was in love with a Mr. Marchand. Jimmersen convinced her friend Nancy Bowen, via the board, to kill Mrs. Marchand first before she could kill Nancy. "Nancy choked Mrs. Marchand with a chloroform-soaked rag and beat her with a hammer," said Murch. In 1933, Mattie Turley of Arizona killer her father to satisfy the board's request. As it happens, Turley's mother had taken a lover, and likely manipulated her daughter with the board to remove hubby from the equation. 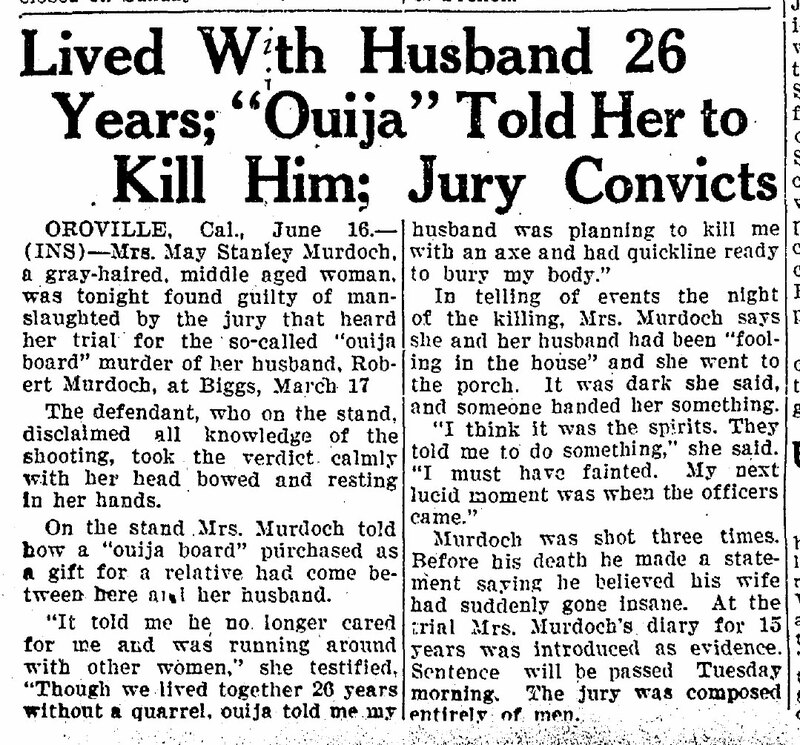 And, in 1935, Hubert Hurd killed his wife in retaliation when she tied him up and tortured him. Mrs. Hurd of Kansas City had been told by the Ouija board that her husband was cheating on her, and stealing their money. And although it didn't involve murder, in 1990, U.S. military analysts deserted their posts when the Ouija board told them the world was ending. Known as The Gulf Breeze Six, they were from the 701st Military Intelligence Brigade at Augsburg, West Germany -- the biggest NSA listening post outside the United States at the time. And none of this dips into the divorces throughout the years blamed on the board! The Ouija board has long been a fascination of the entertainment industry, but it wasn't always the focus of evil conjurings and portals to Hell. In fact, in 1912, Pearl Curran claimed she contacted the spirit Patience Worth, who said, "Many moons ago I lived. Again I come. Patience Worth my name." Pearl went on to transcribe multiple volumes of well-received poetry supplied by Patience. Another popular Ouija-related series of books came in 1963 when Jane Roberts and her husband Robert Butts contact "Seth" via the board. She would go on to write popular New Age books, such as The Seth Material. The first appearance of Ouija in a movie was the 1918 silent comedy short "A Little Ouija Work," directed by C. Graham Baker. And by 1920, Norman Rockwell's famous cover of The Saturday Evening Post was released. The board enjoyed a positive run on television, appearing in the first season of I Love Lucy, in "The Séance" episode in 1951. 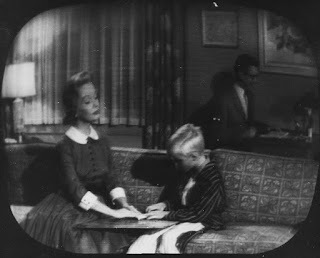 It also popped up in 1960 on the Dennis the Menace episode, "The Raffle Ticket." In 1973, the Ouija board was recast as a horror movie trope when it was used by Regan (Linda Blair) to contact Captain Howdy, aka Pazuzu, in The Exorcist. The impact of the movie on the board's rep can't be overstated, and it never entirely regained its status as useful spirit-comm device or harmless parlor game within pop culture. After The Exorcist, Witchboard is the film that has contributed the most to modern Ouija perception and lore (and Ouija-stitions, as Murch calls them). 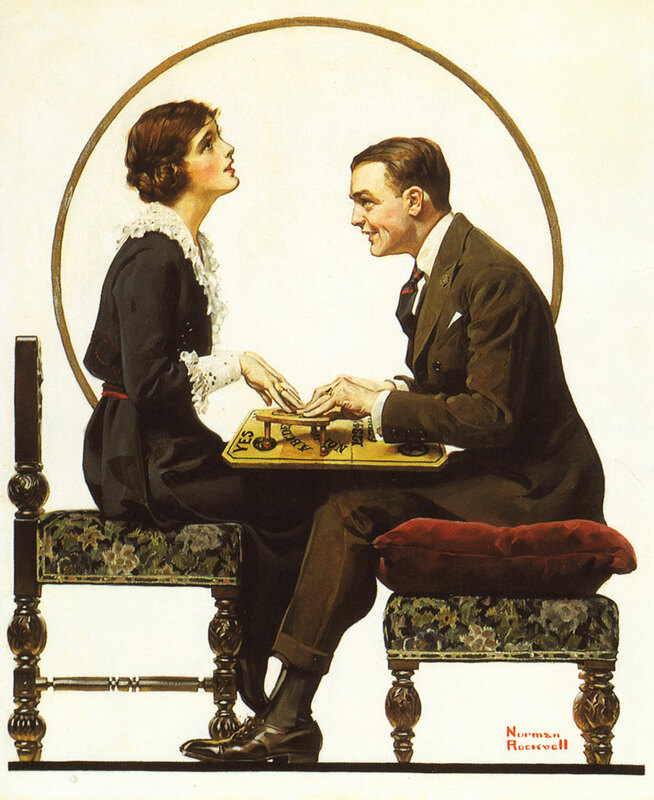 The 1986 film -- released 100 years after the boards first gained attention in Ohio – originated myths such as using the board while alone puts you at risk for "progressive entrapment"; or that Ouija dates back to 540 B.C., and was used by Pythagoras. The Pope of Mope, Morrissey, took on controversy in 1989 when his single "Ouija Board, Ouija Board" was thought to promote the occult. The lyrics "Would you work for me/I have got to get through/To a good friend" revolved around the singer trying to contact a dead friend who does show up, and scares poor Morrissey. In response to censorship from British music show Top of the Pops, the singer released a snarky statement saying, "If this were a slightly more primitive time, I would already be burning at the stake. 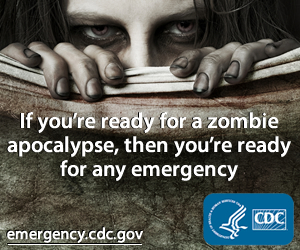 I expect there is still time for that." In 1998, the same year Hasbro removed Fuld's name from the board and released it in a glow-in-the-dark version, Charmed debuted on The WB. The witchy Halliwell sisters utilized a spirit board, but not Ouija, on a recurring basis. And although the former WB show Buffy the Vampire Slayer had been off the air for about five years, a Buffy-themed "Conversations with Dead People" talking board was released in 2008 by Dark Horse. This followed their 2004 Hellboy board (Other pop culture boards included the Hasbro licensed Ozzy Osbourne board by USAopoly in 2011; the 2014 Supernatural Ouija board by USAopoly based on The CW series; Winning Moves Games also released a Hasbro-approved Mystifying Oracle board made of wood, and with original graphics). More than 30 years after The Exorcist, a talking board featured prominently in another horror blockbuster, Paranormal Activity. The scene punctuated how demonic activity was ramping up in the haunted house, and was seen by a lot of viewers when the found footage movie received its 2009 wide release, and went on to gross $193 million. In the same timeframe (between 2005-2007), Jason Hawes of the Syfy paranormal reality series Ghost Hunters, warned against the use of Ouija boards on his web site, The Atlantic Paranormal Society (TAPS): "Stop right now due to the possabiltie [sic] in the future of them having a paranormal situation due to these boards." 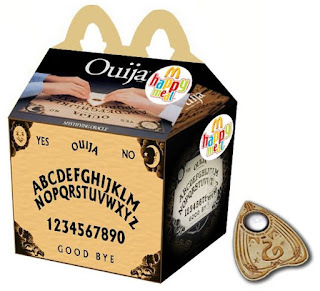 Also within the world of paranormal investigation, Amy Bruni (star of TLC's Kindred Spirits, premiering tonight, and owner of paranormal events company Strange Escapes), posted the parody image of a McDonald's Ouija Happy Meal on her social media channels. Designed by artist Newt Clements, it led to outcry by some overzealous believers who told her to "go get killed by a ghost." In addition to its appearance on Travel Channel's Ghost Adventures, the board was even used by comedian Joan Rivers in the second season of her WE tv series Joan & Melissa: Joan Knows Best? In the February 2012 episode ("Joan Pulls A Beaver"), the two consult the board, and a psychic, about Melissa's love life. Interestingly, Rivers eventually signed a pink board for Murch, and joked, "can we talk? "The board was also used by Murch in last year's Exorcism: Live! on Destination America. The Ouija board still grips the public's attention 126 years after its creation. After 2014's successful, if critically-panned, movie, Ouija, Origin of Evil is receiving better reviews, and may return the board as a topic of talk. Meanwhile, it continues to captivate, even existing in online and app form. The Black Tapes Podcast broke out the board for an episode of weekly creep. The Baltimore theatre production Planchette, also made it center stage. And with last year's news of a Peruvian girl possessed after using a Ouija phone app, it retains its modern-day role as instrument of fear. But whether the board is a source of belief or derided as bunk, Ouija has power over our culture. And it will not be saying "Goodbye" any time soon.